Thank you for choosing Glock Detasseling. We appreciate the opportunity to work with you. One of our highest priorities is to provide a safe working environment that will help you develop a good work ethic. Buses will leave at their scheduled times, regardless of the weather in the mornings. Safety is our number one concern and therefore we will abide by all weather policies. As stated in the Employee Handbook, in the event of lightening, workers will be pulled from the field and required to sit on the bus until an official notification is made. If this does occur in Pioneer fields, each employee is paid minimum wage for "weather delay" and will be noted on their paychecks accordingly. Tassels grow on corn plants. Detasseling involves removing tassels from corn, which forces cross-pollination. Steps involved include finding the tassel, grabbing it, pulling it off, and throwing it to the ground. That is all there is to it! But, it must be done right, or the crop will be ruined. Working together is the key to having a successful season that is fun and gets you the best pay possible. When a crew works efficiently and quickly through a field, meeting time and quality goals, wages for the crew on the whole can improve, resulting in more opportunities for days worked. All paperwork must be completed before you begin work. Paperwork does take several days to process. You may not begin employment until ALL paperwork has been processed. You must attend a meeting to complete the paperwork. See our homepage for meeting details. 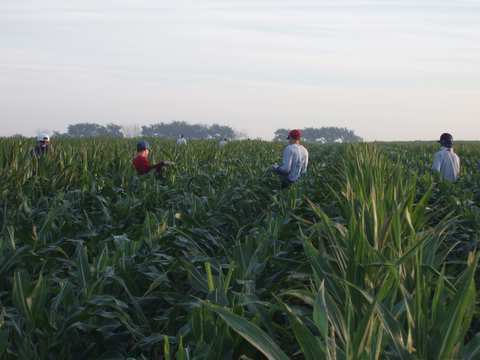 Generally work will begin soon after July 4th, but detasseling can only occur when the corn is “ready”. Glock Detasseling will have approximately 24-48 hours notification. Therefore, the website is an extremely efficient way of notifying you when work is set to begin. As the corn becomes ready, we will update the website on a regular basis. It is your responsibility to check the website and show up for work accordingly. You will not be notified by telephone unless specific arrangements are made. The first day is always the toughest. Show up early to the pick up site & go to bed early the night before. Once you make it a few days, you’ll be in the routine of getting up early and you’ll have fun. Work is conducted 7 days a week (including Sundays). If for some reason an employee is unable to work a day, it is only necessary to notify your supevisor the day before and/or email. The exact season length is never known. Therefore, no specific amount of work can be guaranteed. Factors such as corn growth, weather, and other variables are out of ones control. What is known, is that once work begins, work continues 7 days a week until it's finished. You can estimate somewhere between 15-25 days. Water - Bring plenty of water. A 2-quart or gallon jug is recommended and please put your name on it. These jugs will be taken into the field and can easily be confused with others. Each bus will also have an extra supply the crew can use for refills. Food - Bring a small cooler full of what you like. Fruit, cookies, sandwiches, chips, and snacks. Bring plenty the first day to give you a guide on what to bring the following days. Hat – Any type of cap that keeps the sun off your head is highly recommended. Shirts - You can wear two shirts. An outer long sleeve shirt for the mornings when it is cool and then take it off when it warms up, wearing a short sleeve shirt in the afternoon. You can change how you wear them after the first day. A long sleeve shirt also helps if the corn bothers your forearms (often referred to as “corn rash”). Rain Gear -Bring a poncho or rain gear for the morning dew and for when it rains. We do work in the rain (but not if it’s lightening). Pants or shorts -Light fabric pants or shorts work best. Some people wear long shorts if the corn does not bother them. Jeans are not recommended since they will become wet and heavy and tend not to dry. Socks & Shoes - Wear old tennis shoes! You should plan to hose them off each day and wear them through the entire season. Irrigation or work boots can get heavy & hot. Gloves – You will be provided a pair of gloves at the beginning of the season. We REQUIRE all employees to wear the gloves when they are in the field. If you lose your pair, you will be expected to bring your own. If you do NOT have a pair of gloves, you will be asked to stay on the bus for your safety. Glasses – Safety glasses will also be provided on the first day of work. We REQUIRE all employees to wear the glasses when they are in the field. If you lose your glasses, you will be expected to bring your own. If you do NOT have glasses, you will be asked to stay on the bus for your safety. Accessories - sun block & bug spray are important. If you are allergic to bee stings or have allergies be sure to bring your proper medication and make sure a crew leader is aware of your situation. All other necessary medications should be given to your supervisor and not left on the bus. Transportation is provided to and from the fields every day by Certified Commercial Drivers License holders. Crew leaders will inform employees of all rules and general behavior expectations. All buses are leased and certified with the appropriate inspections conducted through the Department of Labor and Transportation. Any behavior deemed inappropriate by Glock Detasseling. If you or your parent(s) have a concern with Glock Detasseling, any of the rules or policies, or the operations of Glock Detasseling please feel free to email us at glockdetasseling@yahoo.com. We promise to address the situation to the best of our ability and work to make this a positive experience for everyone.